Studio 5380: Programmed for love! I hope you had a great weekend and are ready for another week. The last 2 days have been rainy and stormy around here. We have had up to 8 inches of rain in some areas - my yard looks like a lake! And, my poor Yorkie, Lola, is close to having a nervous breakdown! The thunder just scares her silly, so we have spent a lot of time bundled up in a blanket just cuddling - it seems to soothe her and calm her down. In the last hour or so the sun has started peeking out and Lola has finally settled down on her bed, so I thought I better get this posted while I have a chance! * I started with a gear that I found in the Silhouette Online Store. I used the offset feature to create my cardbase from blue cardstock. * I cut the gear from silver metallic paper and a couple of smaller gears from red metallic paper. *I colored my robot with my Copics and hand cut a flag for the sentiment. * I cut off the end of a toothpick, inked it up with red ink for my flag. * A sweet red, heart shaped gem and some fun red and white twine finish up this fun little Valentine's Day card. Tanya this card is way too cute. I love that image and as always the stamps make the face. 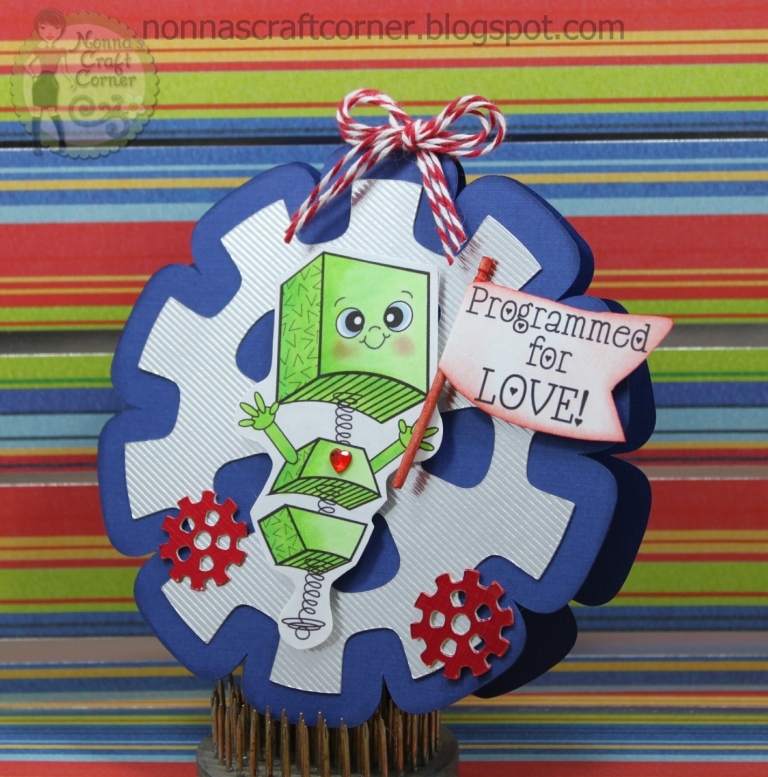 What a cute card.. Love the gear you cut out for this and this stamp is so fun. So Cute! 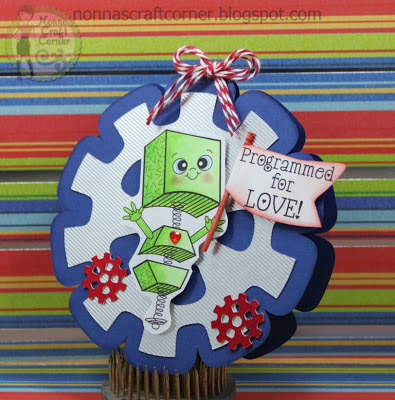 Loved the way you colored the robot in and the colors you choose for your card. Well what can I say???? This is so adorable!!! I TOTALLY love this new release and have it on my wish list for sure!! Awesome job on this cutie card!! This is absolutely adorable! 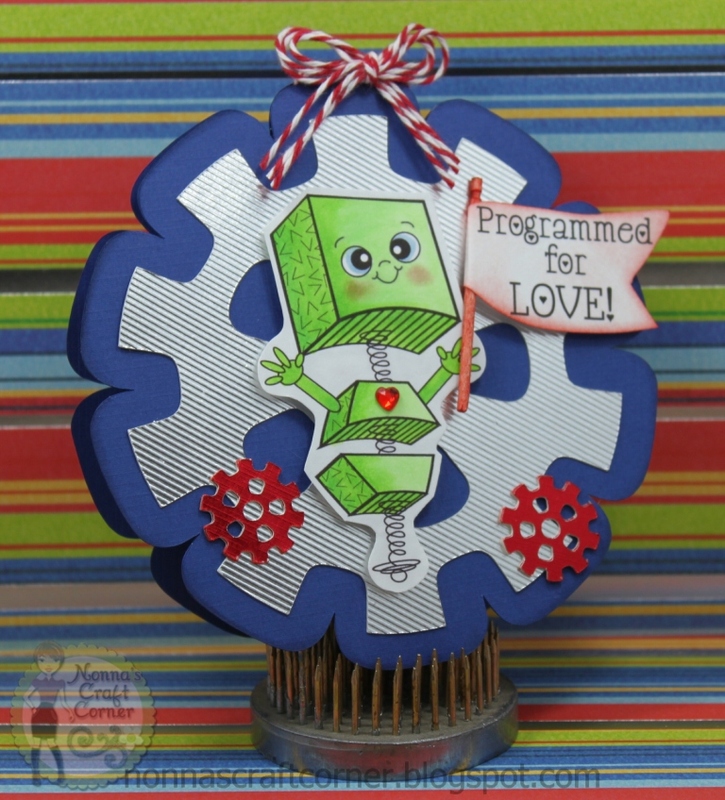 Love that little robot! This is fabulous - love the shape and the image. Great sentiment :-) Have a great week. Poor Miss Lola!!! Bless her heart. Our Angel is terrified of thunder, too. And this go around, hubby said that T-Bone-our Bassett tried to jump in the recliner with him!! WOW, you are definitely rockin' this new release! 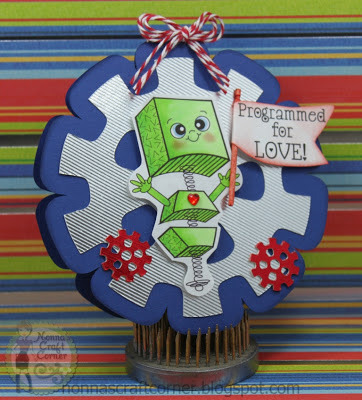 Your projects are amazing:) I love the robot and the gear shaped card-how creative:) I will remember the toothpick for a flag-love that idea!!! Oh, Tanya, I love the shape of your card .The gear is perfect. Such a cute littlerobot. Love that face. ADORABLE!! What do you get when you mix Tanya and Peachy Keen Stamps, AMAZING, that's what !! This is just so dang cute, love how you added the little flag to his hand :) I plan on working on my card tonight for the peachy keen challenge, if my little peanut will let me. Tanya ~ Yet another ADORABLE creation! Again you find the PERFECT shapes and papers!! I LVOE this little image! Oh poor Lola!! She is so sweet too! I have been gone part of the weekend and Thank goodness it was nice traveling weather! Awesome creation ~ again! LOVE your stuff!